The stock EQIII plug‑in may be old, but it still has a few neat tricks up its sleeve. Orson Welles is credited with the quotation, “The enemy of art is the absence of limitations.” While he was talking about money and resources, something similar applies to the tools we use in audio production. Many of us find limitless choice an impediment, and option paralysis is definitely a factor in my choice of EQ plug‑ins in Pro Tools. Channel Strip is newer than EQIII, but is it necessarily better?Plug‑in equalisers fall into two categories: emulations of analogue hardware and the purely digital ‘workhorse’ equalisers that only exist in DAWs. Both, of course, have their place, but I don’t know anyone who doesn’t use a DAW EQ, whereas I know many people who don’t use emulations. Indeed, many of us use different EQs for different tasks, but almost everyone has a first choice: a ‘go‑to’ plug‑in that we turn to first of all before trying anything else. 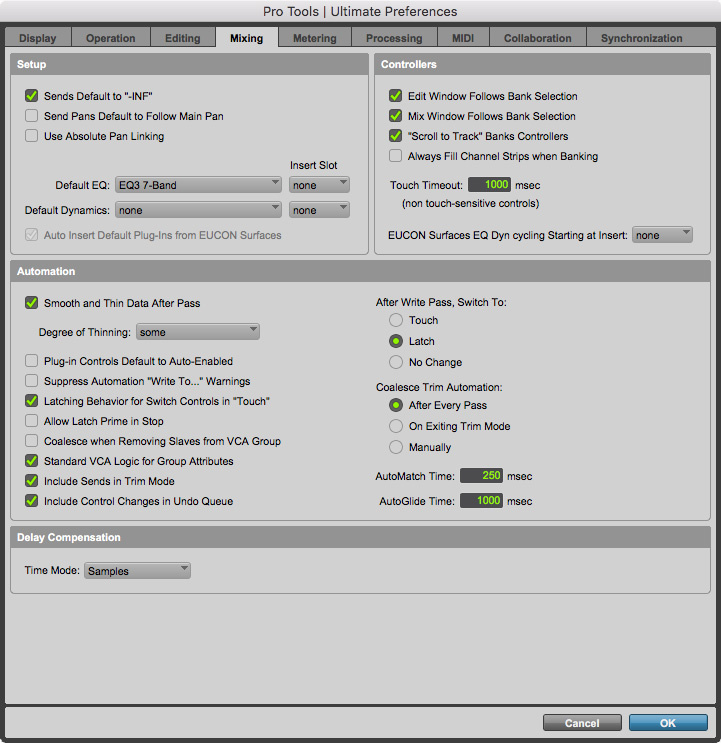 Avid have catered for this in Pro Tools by allowing the user to specify default EQ and dynamics plug‑ins in Preferences. The chosen plug‑ins then appear at the top of their respective plug‑in categories when you click on an insert slot. Many users no doubt want to choose a third‑party plug‑in for this role — anecdotally, FabFilter’s Pro‑Q 2 seems particularly popular — but there are good arguments for sticking to stock Pro Tools plug‑ins, especially if you need to share your sessions with others. Pro Tools has two bundled plug‑ins: EQIII and Channel Strip. 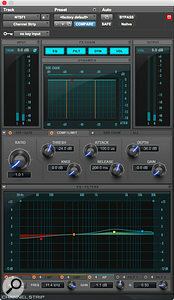 The latter is a more recent introduction, and is the source of the EQ that Avid have added in Clip Effects, which suggests that they see Channel Strip as the ‘main’ Pro Tools EQ, and EQIII as a legacy product. 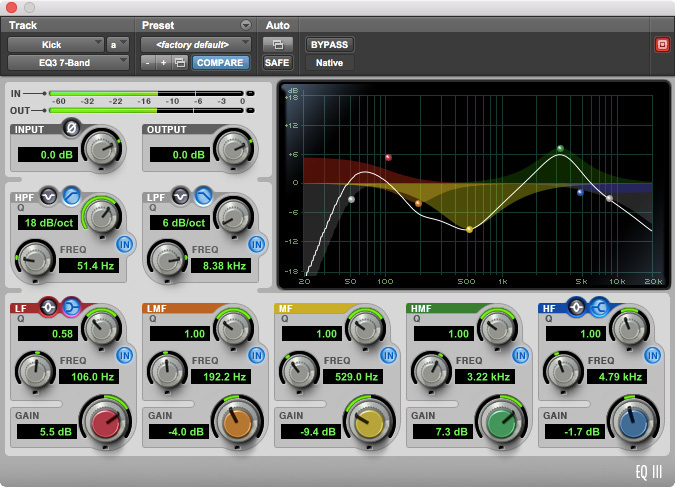 However, my own default EQ is the seven‑band EQIII, and in my experience, this is still much more popular than Channel Strip with Pro Tools users generally. I go through periods of using other plug‑ins, but always come back to it in the end; and although I really like the dynamics section of Channel Strip, I’ve always had some issues which have kept me using EQIII. 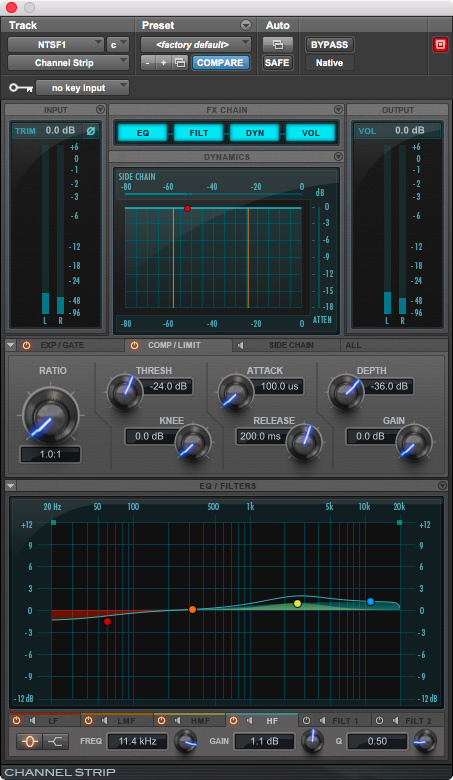 The most important factor when choosing plug‑ins is of course the sound, and in this area the differences between EQIII and Channel Strip are negligible. I’ve found it is possible to null the two plug‑ins almost completely — although, interestingly, you need to use very different Q values to get them to match. The big difference between them is in their layout and usability. I’m not sure whether this is a distinction which holds true across all users, but I certainly see a divide between ‘curve grabbers’ and, er, ‘knob heads’ in terms of how people choose to interact with a software‑only EQ. An unapologetically modern third‑party design such as Pro‑Q 2 caters only to the former: it doesn’t even contain any EQ bands when first instantiated, being very much a blank slate that allows any number of filters to be created without restriction in terms of type or parameter range. To some users this is exactly how things should be, but I prefer the familiar layout of a conventional EQ section; and even though the Channel Strip EQ’s origins lie in the Euphonix System 5 console, EQIII is, for want of a better word, more ‘knob‑centric’. This, I suspect, is at least in part due to its close integration with the ICON range of worksurfaces, the design of which mirrors the user interface. Although both can be driven from the control points using a mouse, the tabbed UI and the size of the knobs show that the Channel Strip EQ isn’t really designed to be controlled using virtual knobs. By default, EQIII opens with a set of defaults which are in line with my expectations, and include high and low shelving bands at each end, as opposed to the bell filters which are found by default in the Channel Strip EQ. The default frequencies are a mixed bag: the highest band in EQIII is set rather low at 6kHz, compared to the much more sensible 10kHz of its Channel Strip counterpart. The low band in Channel Strip is preset at 41.2Hz — the fundamental of a low ‘E’ on a bass guitar — which seems rather low as a default. Fortunately, all of these default frequencies and filter types are easily modified by creating a user default setting in whichever EQ you prefer. To create a user default setting, make the desired changes and save that setting as a preset. With that patch still open select Set As User Default from the plug‑in’s preset menu and then select Settings Preferences / Set Plug‑in Default To / User Setting. The plug‑in should now open by default using the setting you saved. EQIII offers 6dB/octave filters and shelving bands with variable Q. There are, however, some useful EQIII options that are simply not available in Channel Strip. There are two main reasons why I stick with EQIII: because the high‑ and low‑pass filters offer 6dB/octave filters, and because the shelving bands offer variable Q. By contrast, Channel Strip only offers a choice of 12 or 24 dB/octave filters, although 6dB is a really useful option, especially for low‑pass filtering. I often find a 6dB LPF useful as an alternative to a high shelving cut; its progressive nature, cutting more as frequency rises, seems to tame the top end of sources more naturally, but a 12dB roll‑off is almost always too severe. Having variable Q on shelving bands, as in EQIII, also increases their utility so much. Being able to change the slope and corner frequency to tailor the distribution of boosts is indispensable when balancing how much energy is added with exactly where that energy lies. A side‑effect of raising the Q setting on a shelf is that a dip appears just the other side of the corner frequency. This dip, unavoidable in analogue filter design, accentuates the EQ curve in a very natural way. EQIII also supports a few neat moves to make your time spent equalising quicker and more productive. As with many Pro Tools plug‑ins, Alt‑clicking on knobs or control points returns them to their default position, while you can Command‑drag (Ctrl‑drag on Windows) knobs for fine control, though this doesn’t work on control points. It’s also possible to Ctrl‑drag (Windows: Start‑drag) on control points to change the Q setting. You can specify default EQ and dynamics plug‑ins to appear at the top of their categories in the selection pop‑ups.A more unusual feature is the ability to Shift‑click a control point to invert that band’s gain. This is particularly useful with multi‑mono instances: set up a gentle up and down ‘ripple’ curve across the spectrum, unlink the channels, then Shift‑click on the control points in one channel to create the ‘mirror image’ of the other channel’s curve. This gives an EQ‑based stereo widening effect which sums to mono perfectly. Temporarily inverting a cut to a boost can also help you to track down the correct frequency to cut, but an even better tool for this is Band Pass Mode. Holding Ctrl+Shift (Windows: Start+Shift) and dragging either the control point, the gain or the Q momentarily solos that band, allowing quick auditioning and identification of problem frequencies. EQIII isn’t perfect, but for me it’s the best compromise. Channel Strip misses some key features and loses out in usability, while third‑party solutions such as Pro‑Q 2 are a little too far from the hardware paradigm I’m comfortable in, and abandon the ubiquity of a stock plug‑in and the ease they bring to collaboration. EQIII is everywhere, and it is good enough to get the job done — and as Mr Welles so rightly pointed out, some limitations are a good thing. Aren’t they?